Just started to cook your favorite meal and find that you are in need of an oregano substitute? Don't worry there are some fairly common replacements available that are probably already in your kitchen. While cooking is a lot of fun, it can be very frustrating when you don’t have the exact herbs and spices that are called for in a recipe. If you need oregano and have just run out, then you can still complete your dish; you’ll just have to use one of these great substitutes to get the fresh flavor that you need. By considering the other herbs that are going to be used in the dish, you can make sure that you use something that won’t overpower the rest of the flavors. Hands down, this is the best substitute for oregano that you can use. Since the two plants are in the same family, they actually share a number of characteristics. While marjoram tends to be a little sweeter, most people will not be able to recognize that difference when it is used in a dish. Also, since marjoram is not quite as strong as oregano, you will have to use a bit more for your substitution to make sure that you get the full flavor that you want. 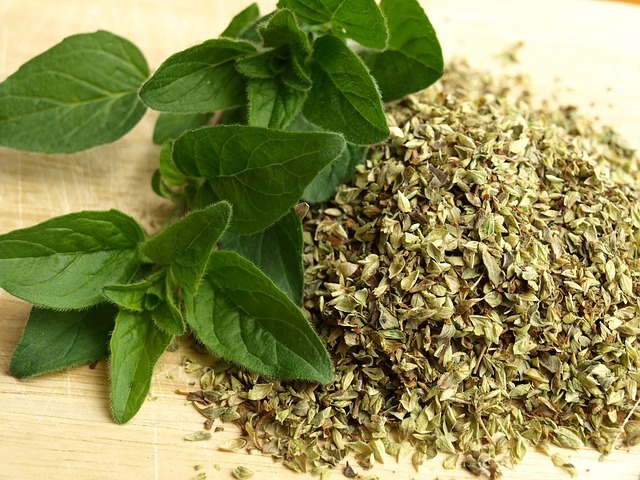 Try substituting marjoram 3:2 the next time you run out of oregano. Always add marjoram at the end of your cooking time as it doesn’t hold its flavor well when it is cooked for a long period of time. Thyme works really well as an oregano substitution as well since it is so closely related to oregano. It does tend to have a slightly sharper or tarter flavor than oregano does but most people will not notice that in tomato-, bean-, or potato-based dishes. Some chefs even use thyme when baking bread, which will add an amazing aroma to the final loaf. You can use the same amount of thyme as oregano in a dish when performing a substitution. Basil is a great substitution, especially in strong and savory dishes. Pizzas and pastas often call for both oregano and basil and if you run out of oregano, you can easily use just basil in the dish. While tomato-based dishes work really well with basil, potatoes also tend to do great with this seasoning. The next time you are in a pinch, try substituting an equal amount of basil for the amount of oregano called for in the recipe. Finally, sage will work as a substitution for oregano but is not the closest match on the list. In this case, you will be much better off using fresh herbs than dried since dried herbs do not taste similar to oregano at all. This herb works best in soup, vegetable, and chicken dishes and can be substituted 1:1 but you will want to add it slowly and taste as you go to make sure that you don’t overpower the dish. You don’t need to panic the next time that you are cooking and are out of oregano. By using one of these herbs or a careful combination of them, you will be able to closely match oregano’s flavor profile and ensure that you end up with a delicious meal.